The Farm Animal Ambulatory Service, led by Dr. Ricardo Stockler, is providing on-location care to farm animals – beef and dairy cattle, sheep, goats, pigs, camelids and chickens – as well as consultations to producers, clients and referring veterinarians. 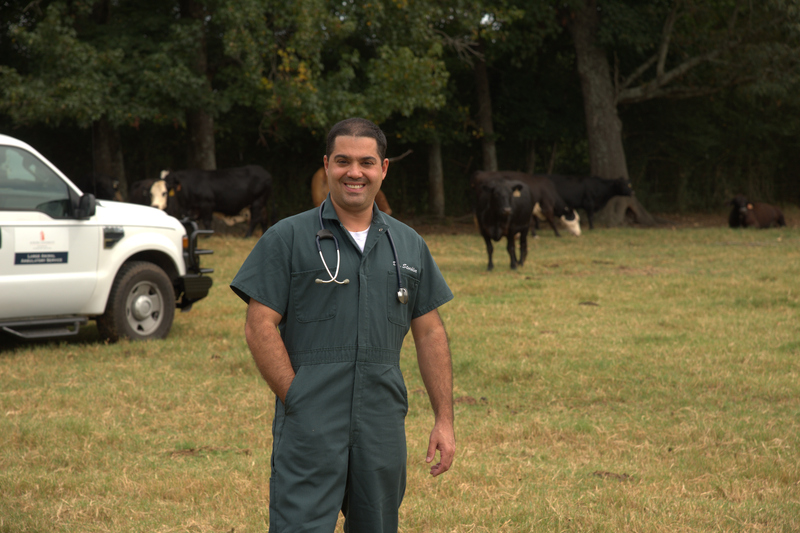 The College of Veterinary Medicine has begun offering an ambulatory service to farms in central Alabama and west Georgia. The service provides individual animal medicine, reproduction and surgery, as well as herd level disease investigation. The service offers a 24-hour veterinary emergency care on the farm, as well as access to the J.T. Vaughan Large Animal Teaching Hospital at the College of Veterinary Medicine. “The opportunity to expand the Ambulatory Service and offer exclusive on-farm veterinary care for farm animals is humbling and of great responsibility. Having the ability to help farmers across the state of Alabama and Georgia and expose the new generation of Auburn veterinarians to agriculture are goals I take seriously,” said Dr. Stockler, who was recently appointment as a member of the Lee County, AL Cattlemen’s Association. The Farm Animal Ambulatory Services will be able to transport a portable cattle chute system to farms to efficiently and economically help the producers work cattle. Farm Animal Ambulatory Service is a program of the J.T. Vaughan Large Animal Teaching Hospital at Auburn. Its mission is to provide exceptional medical care to animals and clinical, hands-on education to senior-level veterinary students. For on-farm visits or appointments, call (334) 844-4490.